Early, knowledge-based selection of the best antibody leads is an important tool in antibody development and has proven its value in the discovery process of novel antibodies. CLIPS Precision Epitope Mapping was specifically developed to provide high resolution results for conformational or discontinuous epitopes, which are often involved in binding of neutralizing antibodies. 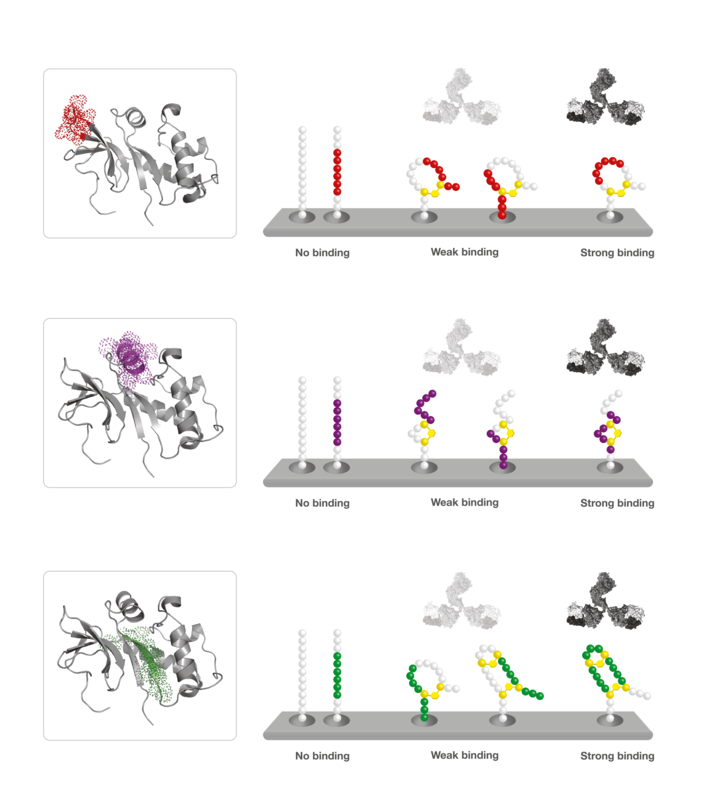 It is the only technology for conformational or discontinuous epitopes that is compatible with purified antibodies as well as polyclonal sera. Therefore, the CLIPS Precision Epitope Mapping platform allows characterization of all types of epitopes at a very early stage of the discovery process. The platform also allows screening and comparing large number of samples on a single peptide library. This feature enables rapid fingerprinting and subsequent selection of the best leads from large collections of antibodies, sera or clones during early stages of the biotherapeutic development. Epitope fingerprinting: Heat map projection and clustering of Precision Epitope Mapping data rapidly identifies sera binding to two specific regions on the HIV-1 gp140 target protein (Uchtenhagen et al., J Immunol, 2014). Rapid characterization and grouping of large sets of complex antibody mixtures. An additional advantage of the re-usable CLIPS conformational peptide arrays is that they can be used for antibodies, antibody-like scaffold and polyclonal sera alike. This makes Pepscan’s Precision Epitope Mapping highly suitable for detailed epitope fingerprinting analysis of large sets of polyclonal sera. This unique advantage is highly relevant in the development of vaccines and antigen discovery. When combined with bioinformatic tools and preliminary clinical data, it allows linkage of particular epitopes to specific patient groups and identification of relevant disease specific epitopes and/or new potential antigens. Conformational and discontinuous epitope mapping also offers the possibility to further develop mapped epitopes into disease specific peptide-based diagnostics. The possibility of detailed epitope fingerprinting of large sets of sera also enables comparison of the epitope profile of sera with any available monoclonal antibody, or simultaneous mapping of different types of sera (human, mouse, other) on the same peptide array. In the example below, profiling the epitope landscapes of large numbers of sera from patients and matched healthy controls allowed the identification of two groups of epitopes linked to protection. These were selected for further vaccine lead development. 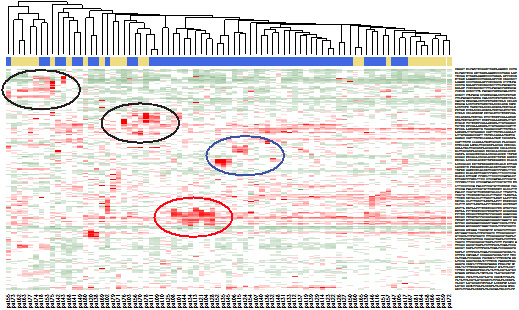 The results of screening of 1200 different CLIPS peptides were summarized into the location of the different epitopes along the amino acid sequence of the target protein Comparing sera from patients (blue bars) and healthy donors (yellow bars) identified four defined epitopes regions). Two groups of epitopes could be linked to the disease (red and blue encircled). These two were selected for further vaccine lead development.